Today’s preview is a member of the super-secret organization, H.A.T.E. and his own origins are shrouded in mystery. What we do know is that he has gone by a LOT of different code-names in the past. Today, we know him simply as “The Captain“. The Captain’s dial is almost as colorful as his personality. His early-dial Charge and Super Strength are staples to many successful strategies, and the rest of his “generic super-abilities” are no slouch as well! Super Strength gives way to Quake which allows The Captain to target several foes at once in close combat, while some late dial “bad breath” (Poison) whittles away at adjacent foes. Impervious, Invulnerability, and Toughness throughout the dial provide the necessary protection to help keep The Captain on the battlemap while Flight allows you to manuever him where he’ll do the most good. 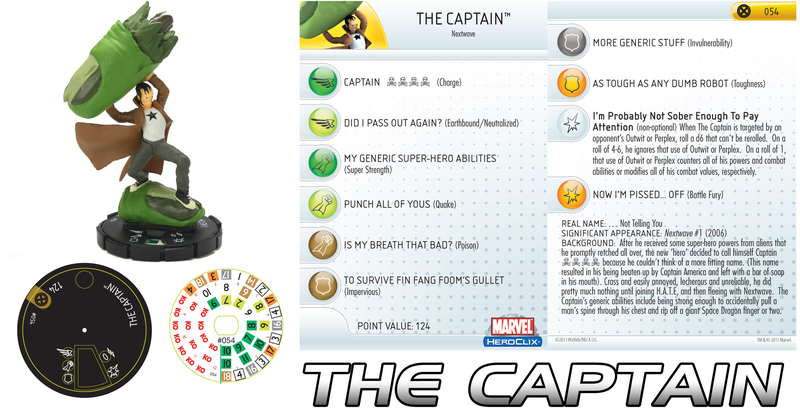 At 124 points, The Captain is a powerful, albeit somewhat unpredictable, ally to any force. His special power enables a chance to ignore the effects of an opponent’s Perplex or Outwit altogether, or perhaps even multiply their effect! Not to worry though, his consistent combat values and useful power array make The Captain an excellent choice for your team! I hope you’ve enjoyed today’s preview as much as I. Join us next week as we continue on with the rest of The Captain’s allies as well as perhaps a special surprise for our loyal HeroClix fans. Until then, have a great weekend and keep your figs off their K.O. clix!